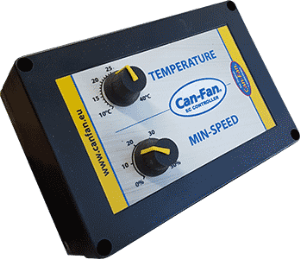 The Can-Fan EC Fan controller regulates the speed of fans to maintain optimal temperature and humidity conditions within the grow room. 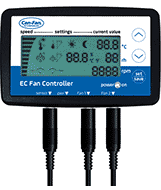 The sensor monitors the current temperature and humidity levels within the growing room, and gradually increases the fan speed until levels are achieved. The two ports on the controller allow intake and exhaust fans to be treated differently. It is very important to set the correct minimum fan speed, so fans do not burn out from too low a setting. The intake and exhaust fans can be programmed to maintain a negative air pressure within the grow room. Separate settings for day and night can be programmed. 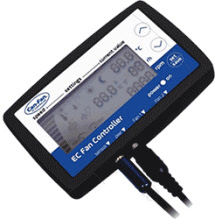 This controller will only work with the Can-Fan EC range of fans. 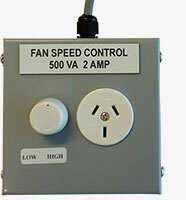 Transformer Based Speed Controllers are ideal for smooth and silent fan speed control. They are capable of running multiple fans at once (do not exceed 90% of rated amperage). They are the only way to reduce the speed of larger fans without compromising the life of the fan motor. Transformer based controllers should not be used with fans that already have integrated speed control. 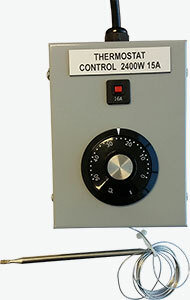 Why use a Transformer based Fan Speed Controller? There are several ways to increase and decrease the mains supply voltage of fan motors in order to change the speed. The most common used variants are Transformer Based or Phase Controlled Modulator (Triac or Thyristor Controllers). A Transformer only changes the amplitude of the sine wave. This means that there is no abrupt increase of the current or any change of the frequency, leading to a smooth speed control of the fan without any additional increase of the noise or the heating of the fan motor. 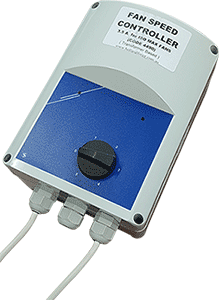 Phase controlled modulators, also known as phased cutting controllers, are an easy and cheap way of reducing the voltage. With these controllers, the supply of power to the fan motor is interrupted intermittently in order to reduce the speed of the fan. The abrupt rise of the voltage and current leads to harmonics in the motor current. The harmonics cause additional losses in the motor which leads to a higher input power and a higher warming of the motor windings. Furthermore, the harmonics also cause mechanical vibrations and noises. 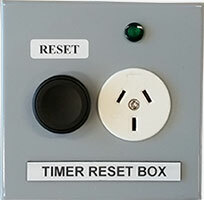 The Timer Reset Box is used to control when power should be restored after a power outage. 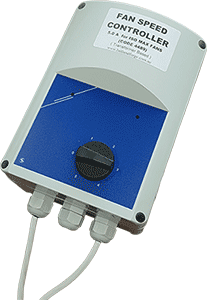 Normally a mechanical timer or light control box (without battery backup) stops when power is lost and restarts from the same (time) position once power is restored. 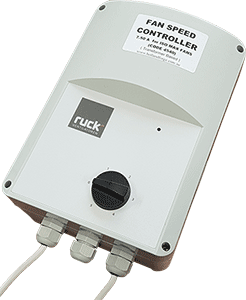 To prevent a grow cycle time getting distorted against real time, the timer or light control box needs to be prevented from automatically starting. The Timer Reset Box does this by preventing power from the box from restoring until the reset button is pressed. This gives the grower the opportunity to make adjustments if necessary before the cycle is restarted.